What was it about the painting Rebecca and Eliezer at the Well that made it so difficult to identify the artist? The painting, purchased by the Government Art Collection from Viscount Astor in 1948, held an unconfirmed attribution note from 1968, indicating the painting was possibly from the circle of Maerten de Vos (1542–1603). The collection asked Art Detectives if this could be verified. 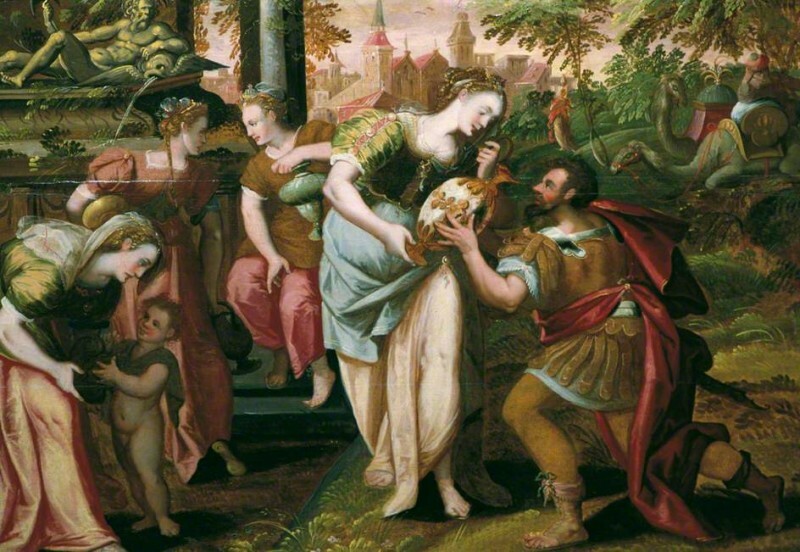 In the sixteenth century, this particular biblical theme was very popular with artists, and there are several interpretations, as Art Detective contributors described. In addition, there are reversed compositions to the original work, which made it even more challenging to identify the artist of the Government Art Collection’s version. Jochen Suy found links to two similar paintings held in the Harvard Art Museum that seemed to be copies after a work by Maerten de Vos. They later unearth a collection of paintings from RKD in the Netherlands, dated 1500–1569, on the same Old Testament theme by different artists in various interpretations. Magdalena Lanuszka said the discussed painting was created after the prints identified in the Harvard Collection and not a copy, as there is an original painting by Maerten de Vos, dated 1562, and retained by the Muse des Beaux Arts, Rouen, which is a reversed composition of the painting in question. She thought the print copies reversed the composition of the original, and the painting in question repeats the prints composition. She pointed out that the Rouen painting is different in some compositional elements, namely the figures. She also discovered an even earlier version by Maerten de Vos, dated early 1560s, formerly in the van Hove collection that is listed in Sotheby’s sale auction catalogue of 2004. Tim Williams felt that the version in Rouen too different from the print for it to be a copy in reverse, as both the Sotheby’s and van Hove versions are different from the one in question. He referred to the location of the camels arriving in both pictures. The Government Art Collection was satisfied with the recommendation that their work is based on a prototype by Maerten de Vos, as per the copies in the Harvard Art Museum, and expressed their thanks for all the comments and references to comparable images. They also discovered two further drawings of the same subject, one in the Louvre that is close to theirs, but in reverse, and another of a seventeenth-century tapestry. The acquisition method recorded for this painting has also been updated to read ‘purchased from Viscount Astor, 1948’.